You know age is catching up with you when you find the tunes on the second disc of this two-disc compilation more familiar than the first. A quick browse through the track listing will clearly tell you that the songs on the second disc are older by about a decade. Not that this is a bad thing though, because this will please all fans of Hong Kong cinema, no matter how old they are. The generous offering of 32 movie theme songs is spread over two discs. The first, running at 56 minutes, comprises of more recent hits from movies like Andrew Lau and Alan Mak’s Infernal Affairs trilogy (2002-2003), Ann Hui’s July Rhapsody (2002) and Derek Yee’s Lost in Time (2003). The second, clocking an hour in length, is a gem for listeners who grew up watching Hong Kong classics in the 1980s. There are songs from old-school movies like Ching Siu Tung’s A Chinese Ghost Story (1987) and Eric Tsang’s Aces Goes Places II (1983). Like the movies, you’d find the performers more familiar if you were born in the 1980s, or earlier. Singers like the late Danny Chan, Sam Hui and Alan Tam have long been in the music business before younger singers like Kelly Chen and Shawn Yue came along. 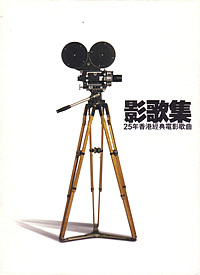 Credit must go to the album producers who put in effort to gather all the copyrights to bring together these deluxe two-disc set which celebrates 25 years of Hong Kong cinema. While the lyrics booklet could have done with a bit more information about the films to make the nostalgic experience complete, we are not complaining. Simply because this has been a wonderful trip down memory lane.